Infectious Coryza (IC) is one of the highly infectious and contagious respiratory tract disease of poultry caused by Avibacterium paragallinarum. It has emerged as one of the major problem of commercial poultry industry worldwide due to huge economic losses in terms of increased number of culls and significant reduction in egg production (10-40%). Scarce reports are available regarding prevalence of Av. paragallinarum from India. The present study was designed to characterize the Indian Av. paragallinarum serovars at molecular level based on the Restriction Fragment Length Polymorphism (RFLP) of 16S ribosomal gene amplified, amplified 16S ribosomal DNA restriction analysis (ARDRA), sequencing of haemagglutinin antigen (hagA) gene and phylogenetic analysis. Four culture positive isolates of Av. paragallinarum, recovered from different geographical locations of the country, were confirmed by species specific HPG-2 Polymerase Chain Reaction (PCR) and other 10 nasal sinus swabs were found positive by direct HPG-2 PCR. ARDRA technique amplified product of 16S ribosomal DNA (r-DNA) showed identical Restriction Enzyme Analysis (REA) pattern for all the isolates indicating presence of similar operons in 16S ribosomal gene. The hagA encoding a haemagglutinin antigen of Av. paragallinarum from all the field isolates revealed homology between Australian A and C serovar strain but did not cluster according to Pages serovar scheme of classification. The present study is first in its nature regarding the molecular characterisation of Indian field isolates of Av. paragallinarum and provides valuable information regarding their genetic nature. Further extensive molecular studies will help both in the identification of field isolates and devising appropriate prevention and control measures for this important pathogen of poultry. Anjaneya , S.D. Singh, K. Dhama, M.Y. Wani, V. Gowthaman and M.M. Chawak, 2014. 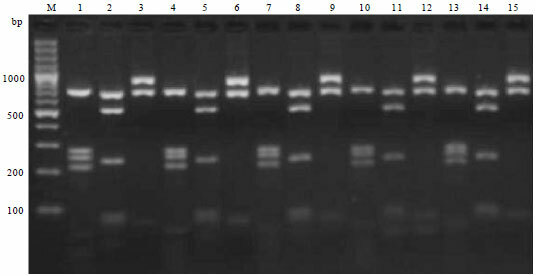 Molecular Characterization of Avibacterium paragallinarum Isolated from Poultry Flocks of India. Asian Journal of Animal and Veterinary Advances, 9: 440-451. Infectious Coryza (IC) is a highly contagious disease affecting the upper respiratory tract of chicken and has emerged as one of the major problem affecting the commercial poultry industry. This disease is of worldwide economic significance, affecting both broiler and layer flocks and is manifested primarily by drop in egg production (10-40%) and retardation in growth rates. Tentative diagnosis of IC is based on the history of a rapid spreading of disease and clinical signs which is further confirmed by isolation of satellitic organism and biochemical characterization (Blackall and Matsumato, 2003). There are several disadvantages associated with conventional diagnostic methods. However, Avibacterium paragallinarum, the causative agent, is a slow growing haemophilic organism, requires NAD (V-factor) for growth in complex media and difficult to grow as pure culture in-vitro. The organism may be easily masked and overgrown by other related haemophilic organism of bacterial family Pasteurellaceae like Avibacterium gallinarum, Av. avium and Av. volantium (Mutters et al., 1985). To overcome such difficulties associated with conventional diagnostic methods, alternative approaches such as multiplex Polymerase Chain Reaction (PCR) (Morales-Erasto et al., 2011; Sakamoto et al., 2012), restriction endonuclease analysis (Blackall et al., 1989), ribotyping and hagA gene sequencing (Miflin et al., 1995; Hobb et al., 2002; Garcia-Sanchez et al., 2014) have been proved to be useful for specific and sensitive identification of Av. paragallinarum. As far as Indian scenario is concerned, IC is one of the major problems affecting commercial poultry industry since its first report (Rao, 1958). However, only few studies have been conducted with regard to laboratory isolation and identification of Av. paragallinarum from the morpho-culturally related organisms from the clinical field cases (Rajurkar et al., 2009). Furthermore, no studies have been conducted regarding the molecular characterization of Indian isolates of Av. paragallinarum. Therefore, the present study was conducted with an aim to characterize the Indian field isolates of Av. paragallinarum at molecular level employing the techniques of Restriction Fragment Length Polymorphism (RFLP) of 16S ribosomal gene, amplified 16S ribosomal DNA restriction analysis (ARDRA), sequencing of haemagglutinin antigen (hagA) gene and phylogenetic analysis. Case history and sample collection: A disease investigation was carried out on freshly dead and ailing birds from 34 commercial farms with the history of respiratory distress, facial swelling and conjunctivitis, from four different states of India viz., Uttar Pradesh, Karnataka, Maharashtra and Madhya Pradesh from May 2010-August 2011. Clinical signs were recorded and necropsy examination was conducted on dead birds. A total of 105 tissue samples and swabs from the respiratory tract (infra-orbital sinuses, nasal cavities, trachea, lungs and air sacs) were collected from clinically ill/dead birds showing the symptoms and lesions suggestive of infectious coryza. Reference strains: The standard reference strains of Av. paragallinarum (strain A and C) were procured from Poultry Diagnostic Research Center, Pune, Maharashtra. Bacterial isolation and biochemical characterization: Initially, blood agar (5% v/v sheep blood) with haemolytic Staphylococcus spp., feeder culture was used for preliminary isolation of Av. paragallinarum isolates. For further subculturing and study, haemophilus agar, haemophilus broth and Brain Heart Infusion (BHI) broth were used. All the isolates were stained by grams staining method and were further subjected to various biochemical tests like oxidase, catalase, urease, nitrate, indole production and sugar fermentation tests as per the standard procedures. Maintenance of the isolates: All the isolates were inoculated into 5-7 days old embryonated chicken eggs via yolk sac and incubated at 37°C for 48 h. Embryos dying after 24 h of inoculation were considered as infected. After that the yolk fluid was harvested and stored at -80°C for further use. DNA extraction: Genomic DNA was isolated from the overnight grown bacterial cultures and tissues by using genomic DNA purification kit (Promega, USA). The extracted DNA was stored at -20°C until used. Polymerase Chain Reaction (PCR): Initial PCR screening was carried out by using N1 (5'-TGAGGGTAGTCTTGCACGCGAAT-3') and R1 (5'-CAAGGTATCGATCGTCTCTCTACT-3') HPG-2 gene specific primer pairs to amplify specific 500 bp fragment of Av. Paragallinarum (Chen et al., 1998). The amplification was carried out using PCR Master mix (2X) (Fermentas, USA), with an initial denaturation at 94°C for 4 min, followed by 35 cycles at 94°C for 1 min, 63°C for 1 min, 72°C for 1 min and a final extension at 72°C for 10 min in Quantum Biotech Thermocycler (USA). Amplification of bacterial 16S ribosomal DNA (r-DNA): Universal bacterial primers comprising of 16F (AGA GTT TGA TCA TGG CTC AG) and 16R (GGT TAC CTT GTT ACG ACT T) were used to amplify 1400 bp fragment from all the isolates of Av. paragallinarum, which were confirmed by gene specific HPG- 2 PCR (Mendoza-Espinoza et al., 2008). The amplification was carried out using PCR Master mix (2X) (Fermentas, USA), with an initial denaturation at 94°C for 15 min, followed by 35 cycles at 94°C for 45 sec, 55°C for 1 min, 72°C for 90 sec and a final extension at 72°C for 10 min in Quantum Biotech Thermocycler (USA). Amplified 16S Ribosomal DNA Restriction Analysis (ARDRA): The restriction endonuclease (RE) enzymes (DdeI, RsaI. EcoRI) used in this study were procured from fermentas (MBI Fermentas, USA). The NEB, New England Web cutter program was used to select endonucleases with the highest number of cutting points. Approximately, 1 μg of amplified DNA was digested with 4U of RE enzymes in a volume of 25 μL incubated at 37°C for overnight as per manufacturers recommended protocol. Amplification of hagA gene of Av. paragallinarum: For sequencing, hagA gene was further amplified by using primer pairs HA1 (TGT AGC TCA AGC AGC TCC ACA AG) and HA2 (TCA AGC GAT AAG TGC TTT ACG ACC) to amplify 900 bp fragment (Hobb et al., 2002). The amplification was carried out using PCR Master mix (2X) (Fermentas, USA), with an initial denaturation at 94°C for 5 min, followed by 35 cycles at 94°C for 1 min, 47°C for 1 min, 72°C for 1.5 min and a final extension at 72°C for 10 min in Quantum biotech thermo cycler (USA). PCR products were purified by employing ExoSAP-IT® (Affymetrix, USA) and sequenced commercially. Phylogenetic analysis: The nucleotide sequence data generated were edited and aligned using sequencing analyses software v5.3 (Applied Biosystems, USA) and MEGA 5 software. The reference sequences were downloaded from GenBank database (NCBI). Phylogenetic analyses and evolutionary associations were inferred in MEGA 5.0 using the Maximum Likelihood algorithm with Kimura-2P correction and 1000 bootstrap replications. Isolation of Avibacterium paragallinarum: Out of 105 samples processed for isolation of Av. paragallinarum, 4 isolates (Jabalpur, Indore, Mysore and CARI) of NAD-dependent Av. paragallinarum were recovered by traditional cultural method. The colonies from solid media revealed distinctive pleomorphic and beaded organisms by grams staining. Biochemical identification tests: Four field isolates and two reference strains showed similar reactions in all the biochemical tests. All these isolates were catalase negative, oxidase positive, reduced nitrate to nitrite, fermented glucose without formation of gas and variability in acid production was observed with mannitol, mannose and sorbitol; while, none produced indole and hydrolysed the urea. Molecular diagnosis of Av. paragallinarum: Gene specific PCR performed on all the four positive cultures and six clinical samples out of 105 samples of Av. 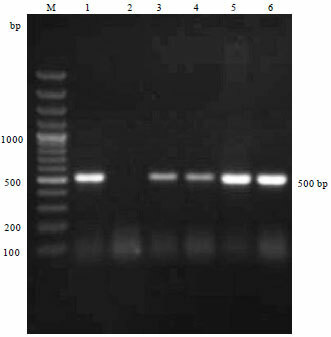 paragallinarum revealed an amplified product of 500 bp with HPG-2 PCR using combination of N1/R1 primers (Fig. 1). PCR assay by using universal bacterial 16SF and 16SR primers used to amplify the 16S r-DNA, carried out on reference strains and all four culture positive isolates of Av. paragallinarum isolates and six infraorbital sinus swab samples showed amplified product size of 1400 bp long amplicon of16S r-DNA region (Fig. 2). Restriction analysis of 16S r-DNA carried out using Dde-I, Rsa-I and EcoR-I enzymes revealed the highest number of cutting points inside the 16S r-DNA. All the isolates of Av. paragallinarum revealed the identical RFLP patterns for each enzyme (Fig. 3). All the four culture positive isolates and two reference strains of Av. paragallinarum amplified the 'hagA' gene specific product size of approx. 900 bp by using HA1 and HA2 primers, suggesting that all the isolates possessed the virulence determinant haemagglutinin outer membrane protein which functions for adhesion (Fig. 4). Phylogenetic analaysis of hagA gene of Av. paragallinarum: The partial hagA gene from the amplified PCR products of all the PCR positive field isolates (Jabalpur, Indore, Mysore and CARI) and reference isolates of Av. paragallinarum were sequenced. The nucleotide sequences were aligned and compared with available respective sequences of Pages serovar A, B and C, P5 OMP of Haemophilus influenza and other serovar specific reference strains by using Clustal-W of MegAlign program (DNA star, USA). Phylogenetic tree constructed on evolutionary distances between type specific page's serovars at nucleotide level revealed rooted tree with Indore isolate forming outgroup. Similar sister clades were exhibited between the Mysore isolate and Jabalpur isolate, CARI isolate and Bengaluru isolate, while Pune isolate shared sister clades with Serovar A and C (Fig. 5). Homology tree by using MEGA4 software based on nucleotide sequence of hagA gene of all the field isolates and other serovar specific reference strains revealed strains did not cluster according to Pages serovar groups. Similar sister clades were exhibited by Jabalpur isolate with Pune isolate; CARI and Indore isolates with Taiwan strain TW96; Mysore isolate with Australian serovar C and Chinese strains. Polyatomic branches were exhibited by Bengaluru isolate with Taiwan strain and other Indian isolates (Fig. 6). Phylogenetic analysis of P5 OMP of Haemophilus influenza at nucleotide sequence level with all the field isolates revealed close sister clades constructed between the Pune isolate and P5 outer membrane gene of H. influenza (Fig. 7). Homology of nucleotide sequence between type specific Page's serovars and all the field isolates revealed 61.4% identity of Pune isolate with serovar C (strain modesto), 45.5% identity of Bengaluru isolate with serovar A (strain 0083) and CARI isolate revealed 40.4% identity with serovar A (strain 0083) (Fig. 8). In the present study, 10 clinical samples out of 105 clinical materials were found positive by direct PCR and four culture positive isolates of Av. paragallinarum were isolated. For primary isolation of NAD-dependent organisms, clinical samples were directly inoculated onto sheep blood agar cross streaked with Staphylococcus spp. feeder culture. The isolates were showing true dependence on NAD and were further purified and maintained by subculturing on Haemophilus agar and Haemophilus broth. Such methods for isolation of organism from clinical samples have been adapted by various workers (Kelser, 1997; Blackall and Yammamoto, 1989; Sobti et al., 2000; Blackall et al., 2005). For further confirmation of Av. paragallinarum, biochemical and sugar fermentation tests were conducted on each isolates. All the isolates were found negative for catalase test. Tongaonkar et al. (2002) and Kaur et al. (2004) have suggested that absence of catalase activity is an impotant biochemical character of Av. paragallinarum. On the other hand, all the isolates obtained in the present study were found positive for oxidase activity. In comparison to this study, Rimler (1979) and Tongaonkar et al. (2002) did not find oxidase as an important test for differentiation of Av. paragallinarum. Moreover, all the identified isolates had the ability to convert nitrates into nitrites however, were negative for indole production. These results are in accordance with the observations of Rimler (1979) and Piechulla et al. (1985). The sugar fermentation tests performed with all the isolates of Av. paragallinarum revealed more or less similar kind of pattern. All the four field isolates fermented and produced acid from glucose, fructose and sucrose without formation of gas. Recently, the diagnostic options available for Infectious Coryza (IC) have been expanded by the availability of species-specific Polymerase Chain Reaction (PCR) for the identification of Av. paragallinarum (Corney et al., 2008). Chen et al. (1996) first described the HPG-2 PCR for diagnosis of IC using two sets of primers combination, N1/R1 which amplified 0.5 kb product. In the present study, molecular diagnostic methodology based on HPG-2 gene specific PCR assay was used to detect Av. paragallinarum directly on nasal and sinus swabs. In addition, PCR was carried out directly from bacterial colonies to determine its efficacy in differentiating from other non-pathogenic avian haemophili. All the four field isolates as well as reference strains of Av. paragallinarum produced the predicted 500 bp product of HPG-2 on PCR amplification, when conducted directly on swab samples and bacterial colony. Application of direct PCR on clinical samples amplified the predicted size of 500 bp products in the samples that were found negative by traditional culture method indicating its high sensitivity. Moreover, the diagnosis of Av. paragallinarum infection has been greatly strengthened by application of HP-2 PCR even after 60 days of storage at -20°C as the traditional culture method failed to detect the isolates even after 48 h of storage. The result of present study thus provided further confirmation to the findings of Chen et al. (1996) indicating the better sensitivity of PCR than traditional culture method for Av. paragallinarum isolation and identification. The amplification of about 0.5 kb product size with HPG-2 PCR has been reported by many workers (Poernomo et al., 2000; Tongaonkar et al., 2002; Kaur et al., 2004; Byarugaba et al., 2007). The Amplified 16S Ribosomal DNA Restriction Analysis (ARDRA), a technique applied to bacteria, is mainly based on the presence of 16S ribosomal gene. In the present study, PCR assay was carried out by using universal bacterial 16SF and 16SR primers to amplify the 16S rDNA for all the field isolates including reference strains. An amplified product size of approximately of 1400 bp was produced using universal bacterial primers. The ARDRA has been used for the identification and differentiation of many bacterial species like Bifidobacterium species (Krizova et al., 2006), Pasteurella pneumotropica (Sasaki et al., 2006) and Mycoplasma species (Stakenborg et al., 2005). In the present study, PCR test and the ARDRA technique applied to all the Av. paragallinarum isolates proved to be a useful tool for identification. The restriction endonuclease analysis (REA) profile patterns of amplified 16S ribosomal genes were found to be characteristic for Av. paragallinarum. These results of ARDRA were in conformity with findings of Mendoza-Espinoza et al. (2008), indicating that 16S rDNA size is highly similar in all the Av. paragallinarum isolates studied. Outer-membrane proteins (OMPs) of pathogenic bacteria are of particular interest in terms of their potential as vaccine candidates due to their roles in virulence and pathogenic mechanisms. Av. paragallinarum isolates possess the virulence determinant haemagglutinin outer membrane protein encoded by hagA gene which functions as adhesion (Barnard et al., 2008). In the present study, PCR assay was carried out using HA1 and HA2 primers to amplify 900 bp core region of OMP hagA gene of Av. paragallinarum isolates. All the field isolates including reference strains amplified the product size of about 900 bp by using HA1 and HA2 primers. The results of detection of hagA gene of Av. paragallinarum isolates were in consistent with the findings of Hobb et al. (2002) and Barnard et al. (2008). The sequencing of hagA gene of all the isolates revealed a small degree of sequence variation indicating that the haemagglutinin to be the major Av. paragallinarum serotyping antigen. None of these sequence variations correlated exactly with the Pages serological groupings of the strains as all the isolates of Av. paragallinarum did not cluster according to the Pages serovar grouping of reference strains (Page, 1962). These findings were in agreement with results of Hobb et al. (2002) and Garcia-Sanchez et al. (2014) and indicated the post-translational modifications of the hagA protein. Variations in haemagglutinin OMP due to the post-translational modifications leads to expression of particular phenotypes and allow serotypic variation amongst strains due to steric hindrance of the haemagglutinin function with another membrane protein. Alternatively, Kume et al. (1983) indicated that there are multiple haemagglutinins identified in single strain. The nucleotide sequence of hagA gene of all the isolates revealed close resemblance to that of the H. influenzae P5 protein. It is believed that the P5 OMP of non-typable H. influenzae (NTHi) may play a role in pathogenesis by acting as an adhesion that binds to respiratory mucin (Webb and Cripps, 1998). It is presumed that a similar mechanism may be play a role in the pathogenesis and infection by Av. paragallinarum. The study provides for the first time the genetic and molecular characterisation of Av. Paragallinarum recovered from poultry flocks from different geographical regions of India. PCR technique was found to be an effective diagnostic tool for rapid and reliable diagnosis of infectious coryza and for differentiating Av. paragallinarum from other non pathogenic avian haemophili. The RFLP profile patterns of amplified 16S ribosomal gene were found to be characteristic for Av. paragallinarum. Furthermore, the ARDRA technique applied to Av. paragallinarum could be used as an alternative rapid method for molecular identification and genotyping of Av. paragallinarum in mixed bacterial infection of upper respiratory tracts in chickens. Sequencing of hagA gene revealed that different types of serovar specific haemagglutinin antigen exist in Indian Av. paragallinarum field isolates. Extensive molecular epidemiological studies in this direction will further provide the insights regarding the genomic variations in the different field isolates, which would help in devising appropriate prevention and control strategies for this important poultry pathogen and alleviating economic losses to the poultry producers. Barnard, T.G., E. Van Heerden, R.R. Bragg and J. Albertyn, 2008. Haemophilus paragallinarum haemagglutinin: Role in adhesion, serotyping and pathogenicity Onderstepoort J. Vet. Res., 75: 11-16. Blackall, P.J. and M. Matsumoto, 2003. Infectious Coryza. In: Diseases of Poultry, Saif, Y.M., H.J. Barnes, J.R. Glisson, A.M. Fadly, L.R. McDougald and D.A. Swayne (Eds.). 11th Edn., Iowa State University Press, Ames, Iowa, USA., pp: 691-703. Blackall, P.J. and R. Yamamoto, 1989. 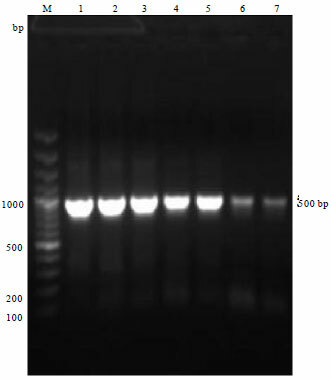 Whole-cell protein profiles of Haemophilus paragallinarum as detected by polyacrylamide gel electrophoresis. Avian Dis., 33: 168-173. Blackall, P.J., H. Christensen, T. Beckenham, L.L. Blackall and M. Bisgaard, 2005. Reclassification of Pasteurella gallinarum, [Haemophilus] paragallinarum, Pasteurella avium and Pasteurella volantium as Avibacterium gallinarum gen. nov., comb. nov., Avibacterium paragallinarum comb. nov., Avibacterium avium comb. nov. and Avibacterium volantium comb. nov. Int. J. Syst. Evol. Microbiol., 55: 353-362. Blackall, P.J., L.E. Eaves and G. Aus, 1989. Serotyping of Haemophilus paragallinarum by the Page scheme: Comparison of the use of agglutination and hemagglutination-inhibition tests. Avian Dis., 34: 643-645. Byarugaba, D.K., U.M. Minga, P.S. Gwakisa, E. Katunguka-Rwakishaya, M. Bisgaard and J.E. Olsen, 2007. Virulence characterization of Avibacterium paragallinarum isolates from Uganda. Avian Pathol., 36: 35-42. Chen, X., J.K. Miflin, P. Zhang and P.J. Blackall, 1996. Development and application of DNA probes and PCR tests for Haemophilus paragallinarum. Avian Dis., 40: 398-407. Chen, X., Q. Chen, P. Zhang, W. Feng and P.J. Blackall, 1998. 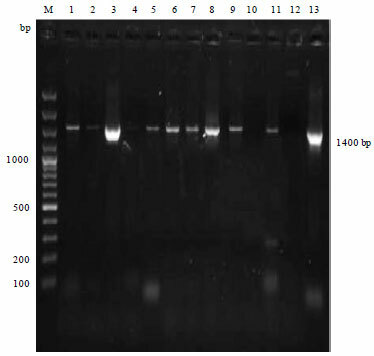 Evaluation of a PCR test for the detection of Haemophilus paragallinarum in China. Avian Pathol., 27: 296-300. Corney, B.G., I.S. Diallo, L. Wright, G. Hewitson and A. De Jong et al., 2008. Rapid and sensitive detection of Avibacterium paragallinarum in the presence of other bacteria using a 5' Taq nuclease assay: A new tool for diagnosing infectious coryza. Avian Pathol., 37: 599-604. Garcia-Sanchez, A., V. Morales-Erasto, M. Talavera-Rojas, F. Robles-Gonzalez, M.S. Allen, P.J. Blackall and E. Soriano-Vargas, 2014. Phylogenetic relationship of serovar C-1 isolates of Avibacterium paragallinarum. Avian Dis., 58: 143-146. Hobb, R.I., H.J. Tseng, J.E. Downes, T.D. Terry, P.J. Blackall, M. Takagi and M.P. Jennings, 2002. Molecular analysis of a haemagglutinin of Haemophilus paragallinarum. Microbiology, 148: 2171-2179. Kaur, J., N.S. Sharma, K. Gupta and A. Singh, 2004. Epidemiological studies on infectious coryza in chickens in northern India. Indian J. Anim. Sci., 74: 462-465. Kelser, K., 1997. Isolation and identification of H. paragallinarum from cases of infectious coryza. Veterinaria, 8: 1-8. Krizova, J., A. Spanova and B. Rittich, 2006. Evaluation of Amplified Ribosomal DNA Restriction Analysis (ARDRA) and species-specific PCR for identification of Bifidobacterium species. Syst. Applied Microbiol., 29: 36-44. Kume, K., A. Sawata and T. Nakai, 1983. Serologic and immunologic studies on three types of hemagglutinin of Haemophilus paragallinarum serotype 1 organisms. Jpn. J. Vet. Sci., 45: 783-792. Mendoza-Espinoza, A., Y.D. Koga and A.I. Zavaleta, 2008. Amplified 16S ribosomal DNA restriction analysis for identification of Avibacterium paragallinarum. Avian Dis., 52: 54-58. Miflin, J.K., R.F. Horner, P.J. Blackall, X. Chen and G.C. Bishop et al., 1995. Phenotypic and molecular characterization of V-factor (NAD)-independent Haemophilus paragallinarum. Avian Dis., 39: 304-308. Morales-Erasto, V., A. Garcia-Sanchez, C. Salgado-Miranda, M. Talavera-Rojas, F. Robles-Gonzalez, P.J. Blackall and E. Soriano-Vargas, 2011. ERIC-PCR genotyping of emergent serovar C-1 isolates of Avibacterium paragallinarum from Mexico. Avian Dis., 55: 686-688. Mutters, R., K. Piechulla, K.H. Hinz and W. Mannheim, 1985. Pasteurella avium (Hinz and Kunjara 1977) comb. nov. and Pasteurella volantium sp. nov. Int. J. Syst. Bacteriol., 35: 5-9. Page, L.A., 1962. Haemophilus infections in chickens. I. Characteristics of 12 Haemophilus isolates recovered from diseased chickens. Am. J. Vet. Res., 23: 85-95. Piechulla, K., K.H. Hinz and W. Mannheim, 1985. Genetic and phenotypic comparison of three new avian Haemophilus-like taxa and of Haemophilus paragallinarum Biberstein and White 1969 with other members of the family Pasteurellaceae Pohl 1981. Avian Dis., 29: 601-612. Poernomo, S., M. Rafiee and P.J. Blackall, 2000. Characterisation of isolates of Haemophilus paragallinarum from Indonesia. Aust. Vet. J., 78: 759-762. Rajurkar, G., A. Roy and M.M. Yadav, 2009. An overview on epidemiologic investigations of infectious coryza. Vet. World, 2: 401-403. Rao, V.S.R., 1958. Infectious coryza: An observation report. Poult. Adviser, 21: 49-54. Rimler, R.B., 1979. Studies of the pathogenic avian Haemophili. Avian Dis., 24: 1006-1018. Sakamoto, R., Y. Kino and M. Sakaguchi, 2012. Development of a multiplex PCR and PCR-RFLP method for serotyping of Avibacterium paragallinarum. J. Vet. Med. Sci., 74: 271-273. Sasaki, H., E. Kawamoto, E. Okiyama, H. Ueshiba, K. Mikazuki, H. Amao and T. Sawada, 2006. Molecular typing of Pasteurella pneumotropica isolated from rodents by amplified 16S ribosomal DNA restriction analysis and pulsed‐field gel electrophoresis. Microbiol. Immunol., 50: 265-272. Sobti, D.K., N.S. Dhanesar and V.K. Chaturvedi, 2000. Prevalence of infectious coryza in poultry birds in Jabalpur. JNKVV Res. J., 34: 54-56. Tongaonkar, S., S. Deshmukh and P.J. Blackall, 2002. Characterization of Indian isolates of Haemophilus paragallinarum. Proceedings of the 51st Western Poultry Disease Conference, May 1-4, 2002, Peurto Vallajarta, Mexico, pp: 58-58. Webb, D.C. and A.W. Cripps, 1998. Secondary structure and molecular analysis of interstrain variability in the P5 outer-membrane protein of non-typable Haemophilus influenzae isolated from diverse anatomical sites. J. Med. Microbiol., 47: 1059-1067.